A couple weeks ago I got an chance at an excellent opportunity – putting up an art installation in an empty storefront of the Ballard Neighborhood of Seattle. 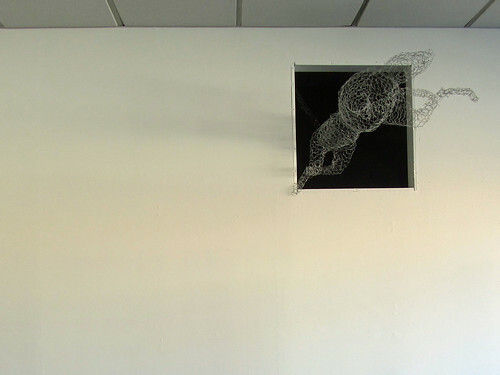 Now, after three weeks of work battling 240 square feet of chicken wire into 17 sculptures, the piece is finally fully complete! We’ll be having an art opening to celebrate at 5607 20th ave NW this Saturday, September 10th, from 6 to 9pm. My work with chicken wire as a foam armature had led me to realize that chicken wire itself is a surprisingly nice sculpture material. It’s great for making rapid, expressive beasts. You can tweak it repeatedly without weakening it, changing your beast’s stance as much as you want. 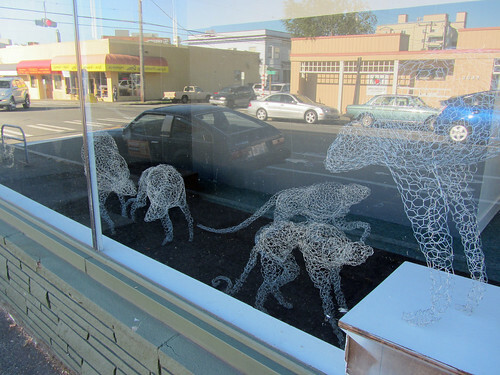 In addition to this, the end beast looks surprisingly good as straight chicken wire. The effect is ghostly and striking. When this opportunity in Ballard showed up, I sprung for it. I’ve long been thinking about an installation of large running beasts, but had nowhere to display such a thing. I decided to create a version of this idea, choosing chicken wire over a more conventional material for its speed and unusual appearance. I gave myself two weeks to create as many running beasts as I could, and took another week fine tuning the final piece. In the end, I even made a time lapse video of the final beast. 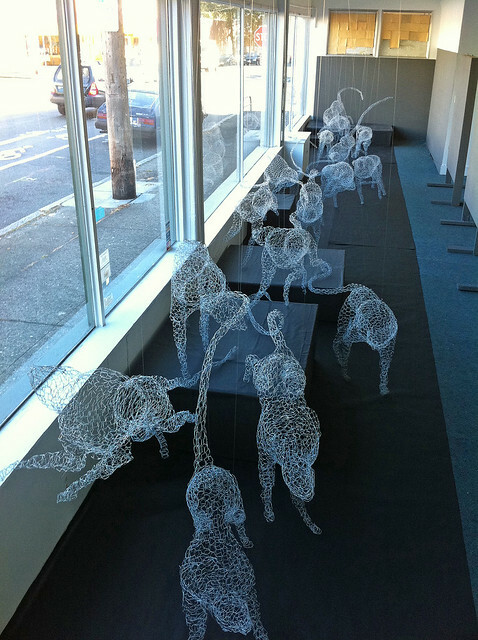 In the end, I finished up 17 beasts, using around 240 square feet of chicken wire. Karol, the manager of the U-Frame-It was nice enough to donate black paper to go under the beasts, which allowed gave the chicken wire more contrast. We’re actually working together to help set up a pop up art show for this Saturday, the 10th. If you’re in the area, please come on by the storefront at from 6 to 9pm for art, fun, and refreshments. The only downside of the beasts is that they’re very hard to photograph. I’m planning on doing another photo shoot later, which will hopefully give me some more photos to post here.